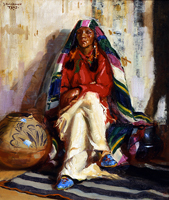 In the early 20th century, artists began to make their way to the American Southwest, intrigued by the landscape and the Pueblo culture of the region. In Taos, a group of twelve artists would band together in their quest to paint the land and people of northern New Mexico. 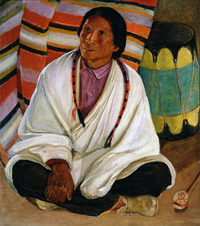 Founded by Ernest Blumenschein, Bert Phillips, Oscar E. Berninghaus, E. Irving Couse, Joseph Henry Sharp, and William H. Dunton in 1915, the group, known as the Taos Society of Artists, grew to include Victor Higgins, E. Martin Hennings, Julius Rolshoven, Catherine Critcher, Walter Ufer, and Kenneth Adams. 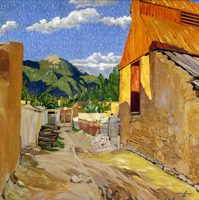 Their work introduced the country to the landscape and Indian culture of the region and was essential in establishing Taos as an artist center that attracted such important 20th century Modernist artists as Georgia O'Keefe, Stuart Davis, John Marin, and Marsden Hartley. The Taos Society of Artists, 1915-1927 presents examples of each of the twelve members of the group through the generous loans of the Harwood Museum (University of New Mexico) and private collectors. Funded in part by John and Mari Ann Martin and the National Advisory Board of the UW Art Museum.